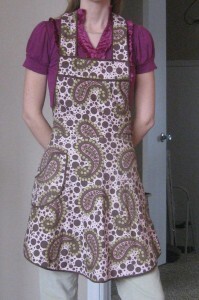 I love aprons. Due to their recent comeback, there are a lot of really fun patterns out now, many are free. 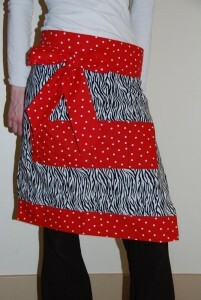 If you want to try your hand at a simple sewing project, an apron is a great place to begin. Here’s my version…added some pockets. I prefer the full apron because I’m a messy cook I love the way this retro apron looks when wearing it…use a heavier weight, quality fabric and you will get nice little flares in the skirt that hold their shape. Just enough femininity without being too frilly. 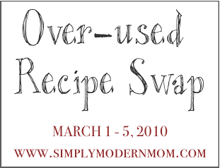 Speaking of cooking, Simply Modern Mom is currently conducting an “over-used recipe swap.” I’m linking up Baked Ziti….it is our go-to recipe right now. Lot’s of flavor, ingredients that we normally have on hand, and it is finished in a half an hour!! It is a recipe out of our “30-Minute Recipes by America’s Test Kitchen“. Oh how I LOVE their cookbooks. 1. Heat oven. Rack in middle position. 475 degrees. 2. Simmer Ziti. Combine oil, garlic, pepper flakes, and 1/2 teaspoon salt in 12-inch oven safe nonstick skillet and saute over medium-high heat until fragrant, about 1 minute. Add crushed tomatoes, water, ziti, and 1/2 tsp. salt. Cover cook, stirring often and adjusting the heat as needed to maintain a vigorous simmer, until ziti is almost tender, 15-18 minutes. 3. Add cheese and bake. Stir in cream, parmesan, and basil. Season with salt and pepper to taste. Sprinkle mozzarella evenly over ziti. Transfer skillet to oven (or in our case, we transfer the ziti into a 2 quart glass dish because our pans aren’t oven safe) and bake untikl cheese has melted and browned. About 10 minutes. Michelle I tried this Baked Ziti recipe with a few minor changes to fit with the items in my pantry. I really enjoyed it and it was easy to make too! Keep the ideas coming. They’re great.